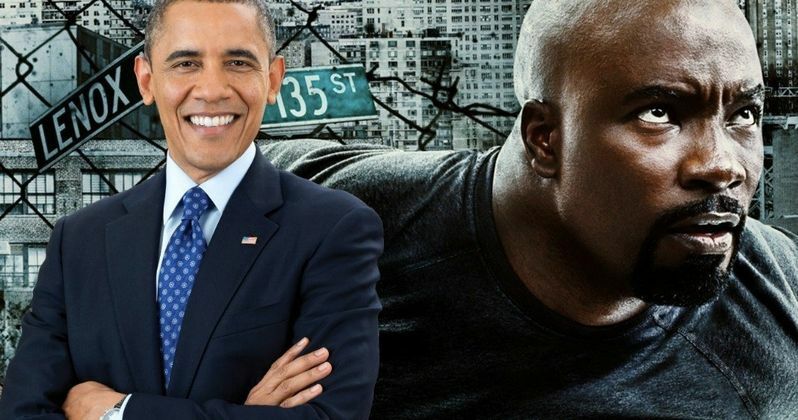 Season 1 of Luke Cage officially recognized Barack Obama as President in the Marvel Cinematic Universe, and now, star Mike Colter wants the former president to make a cameo in the upcoming Season 3. Season 2 of the Marvel Netflix show premiered last week and has gained favorable reviews with many fans and critics hailing it as better than the first season. The idea of Obama making a cameo on the show isn't too far off since he and wife Michelle Obama recently signed a deal with Netflix. Mike Colter was asked by TMZ who his dream celebrity guest star on Luke Cage would be. The interviewer was actually the one to suggest former President Barack Obama, which made Colter laugh and say, "I think he can cameo in anything he wants to." While that's true, Obama would make for a great cameo for the Marvel series. Colter went on to talk about the former president possibly taking on a villain role. He explains. "We shoot in Harlem, we got a lot of good places to eat. Maybe he can come and do a cameo and we can have a bite to eat... He's been a hero a long time, maybe he can be a villain this time." Most of the Marvel TV shows recognize fictional president Matthew Ellis, but Luke Cage has taken on Barack Obama in Season 1 and now Donald Trump in the latest season. Season 2 of the show mentions the Trump campaign multiple times and not in the most flattering light. Obama served one term on the show, so it leads one to believe that Trump will only serve one term as well, especially after the Make America Great slogan was seen as negative on the show when the slogan is used by Cage in reference to Harlem. Infinity War could have had an impact on the upcoming Luke Cage Season 3, meaning that Thanos' snap may have wiped out Donald Trump or perhaps even Barack Obama, so it will be interesting to see where the series goes with that idea. If Trump is in a dustbin somewhere, he can't be president. We'll just have to wait and see who is president if and when Luke Cage Season 3 premieres next year. Luke Cage Season 3 has yet to be officially announced at this time, but if it follows normal Netflix announcements, it should be revealed in the coming weeks. After the success of the latest season, Season 3 seems like a sure bet, with or without a Barack Obama cameo. Barack and Michelle Obama signed a deal with Netflix to produce television shows and films for the streaming giant. The production company is called Higher Ground and it will give the former president a new international platform. You can read more about the possibility of an Obama cameo in Luke Cage Season 3 over at TMZ.